You might be worried about the future availability or continued use of R22 after January 1, 2020. On that date the U.S. Environment Protection Agency (EPA) phaseout of newly manufactured or imported R22 goes into effect. Rest assured that R22 will remain legal to use and widely available long after January 1, 2020. Need independent proof? 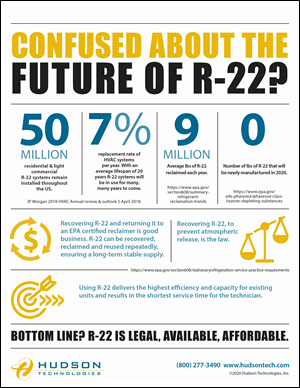 Check out this EPA brochure detailing the facts about R22. R22 is in residential systems, businesses, campuses, industrial sites – just about everywhere! In 2020, despite the virgin manufacturing ban R22 will still be the most widely used refrigerant in the U.S. Contact us now for more information about R22 or request a quote.